When I was little I had almost every Ninja Turtle they made. We used to go around to all the different stores (who remembers Child World?) trying to track them down. (I remember the Manta Ray was the hardest to find..) What’s wacky about my story is that even at the age of three, I had two of every figure. One to play with, and the other to keep in the package. So, somewhere in my vast collection of toys (that I hope to catalog here!) 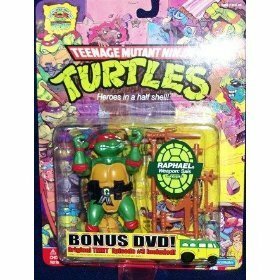 I still have many of the Ninja Turtles still in their original packaging! I don’t like the template of the blog either, temporary until I find or customize something I actually like..
Hello world! I’m sure no one is going to notice, but I just totally ripped apart joesstuff.com. When I first registered the domain (quickly, I might add, as I missed out on it the first time around and had to wait until it expired) I didn’t really know what I wanted to do with it.. Wanted a place to store all my stuff (which is now at another domain actually) and didn’t want anything to do with the free sites and banner ads. I originally toyed with the idea of setting up a blog and then linking the store to it, and planned on selling what I blogged about.. It was a pretty good idea, but for whatever reason I ended up making the store the main part of the site with nothing.. (I made more on ebay than through my little piece of web, but I really enjoyed coding the storefront and the few customers it brought me) Time went by and I really didn’t have the funding to keep up the store (though I do sell from time to time on ebay) and yesterday I decided that I needed yet another project (I have a fulltime job, as well as a fulltime website, three Facebook applications in the works, and many random other things) so I totally gutted the storefront (it’s archived and saved, it will be back integrated with the blog and possibly a message board just because I can) and setup this blog. It won’t look like this for long, I plan on customizing it, but I’ve never really used wordpress before so it’s yet another learning process. Special thanks to anyone reading this!